The Xbox One is a powerful bit of kit, but all those options that it enables doesn't for a second make it difficult to use, and at the centre of your experience, the Xbox dashboard will be your intuitive friend. 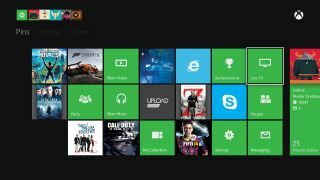 The dashboard will become a familiar sight as you use your Xbox One, allowing you to pin the apps and games that you use the most, quickly let you back into what you are doing and even allow you to do a bit of multitasking should you feel the need. That makes for a straightforward and highly customisable experience that will bring real personalisation to your Xbox One. Even better, each person who uses the Xbox One can use their own sign in to get their own experience on dashboard, which means you'll know exactly where your favourite stuff lives. If you're already signed in then you will see your avatar and gamerscore, as well as an indication of how many messages you have: this is the quick information that you will be looking for and it's immediately visible on your first dashboard screen. If you're not signed in then this tile will urge to do so, and clicking on it will take you to profile selection pane where you can either select your profile or add a new one. Your home screen is personalised so that for every profile you will see a different experience, with your recent activity playing its part in putting the most relevant apps and games right where you can see them in the most obvious main tile and the surrounding smaller panels. That's useful for those of us that get obsessive about a single game for weeks on end, allowing you to quickly jump back into gameplay or to pick up whatever you were doing last. If you go left in the dashboard then you will see your 'pins' - the things you select to be 'pinned' to your dashboard. One way you can pin something is to go to the 'my games and apps' tile on the first screen you see - then it's a simple matter of highlighting your chosen one, pressing the menu button on your controller then selecting pin to home. It's an obvious intuitive system and one that you will quickly be using to make sure your dashboard is customised to your liking. Getting back to your home is easy - just press the Xbox button and you'll be returned to your screen or, if you want to use the Xbox One's voice controls simply say 'Xbox go home'. There should be no getting lost in an endless loop of menus! One of the coolest new features of the Xbox One is its 'snap' feature, which allows you to multitask and do a couple of things at once. To see if an app will snap you simply highlight the snap panel and then choose from a list of candidates. Switching between your main app and the 'snapped' app takes a double tap of the Xbox Button, which means you can merrily get more than one thing done at a time. Of course, you can always take the button pressing out of the equation by saying 'Xbox Switch'. Unsnapping the app is simple too - the panel that you clicked to snap the app will now say 'unsnap' and put you back to normal. Closing an app or game in Xbox is pretty straightforward: you use your trusty Xbox button to go back to your now familiar homescreen, make sure that the game or app you are running is highlighted and then press the menu button. One of the options will be 'quit' and you will be back to the start again, ready to explore the world of Xbox. When you download games, apps and other content to your Xbox One, finding it is really simple, and here's a top tip. If you go to games and apps and press the 'A' button then it will display all of your downloaded content with the most recently added at the top. An even better tip is to make use of the Xbox Help app, which is well worth pinning as you get to grips with your new console. It can help you with anything to the gestures that you can use with your Kinect to navigate your way around right down to more complex problems - and should put an end to that frustrating moment where you simply don't know what to do next. The Xbox One dashboard has been designed to be a simple, powerful tool that will allow you to quickly get to exactly what you need to do as quickly as possible. With Kinect voice and gesture control, pinning apps, snap apps and an intuitive interface the dashboard will quickly be the perfect start to each Xbox experience.